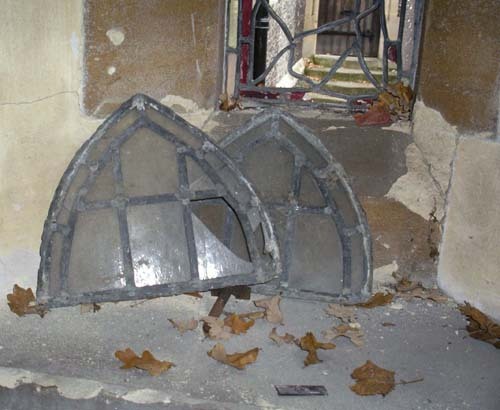 I was approached by Father Adrian Benjamin, the Vicar at All Saints Church in Whetstone, London, to rebuild two porch windows that had been kicked in and destroyed by vandals. 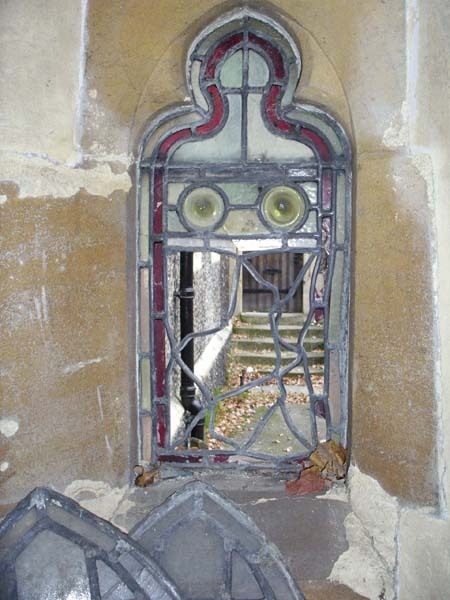 This picture is of one of the existing, undamaged windows that I was trying to match. To begin with I traced over the two remaining windows to get a fairly accurate outline. With that as a guide I then did an accurate drawing with all the exact measurements for the lead and glass panes. Luckily I was able to salvage some of the broken glass. 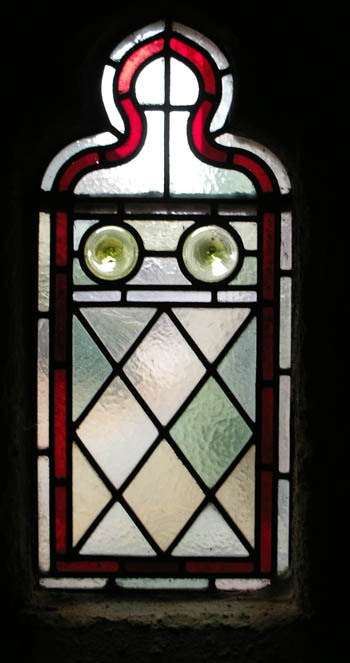 It was difficult to match as the glass is Victorian and the exact shades are no longer made. With the help of a good glass supplier I was able to get what I needed. In line with the church's tradition of cryptic messages, Father Benjamin asked me to have some lettering added to one of the panes. 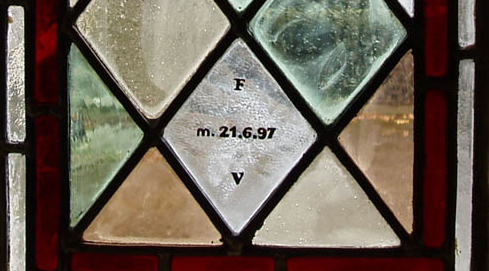 With the help of a stained glass painter I had the initials and marriage date of two of the parishioners fired onto the glass. 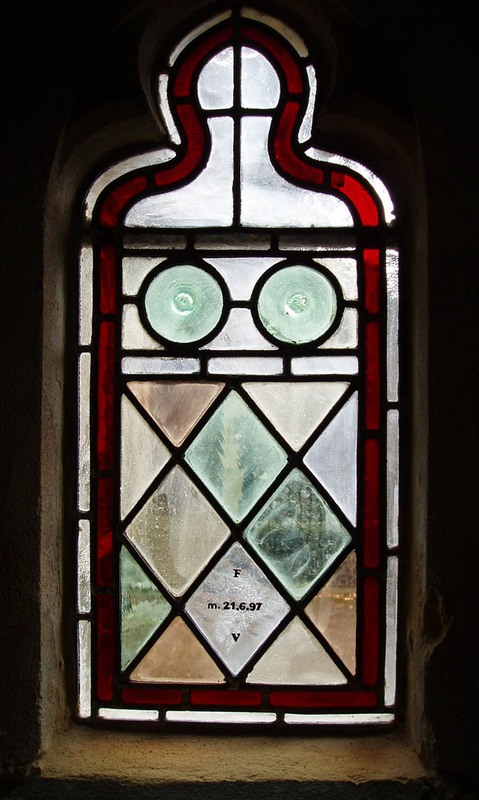 (This was done as a surprise to be unveiled to them at a later date) The windows were installed by the church's stone mason, who also restored much of the crumbling stonework to its former glory. Now, rather than being a storage area, electric lights have been installed for the Church notice area and it is now the exit door for Sunday services. The windows were installed by the church's stone mason, who also restored much of the crumbling stonework to its former glory. Now, rather than being a storage area, electric lights have been installed for the Church notice area and it is now the exit door for Sunday services.